Residents in a two-building shelter for homeless families in the Atlantic Yards footprint just got some not-so-sunny holiday greetings, as the facility is slated to be closed by January 15. A mandatory meeting at Pacific Dean will be held tonight "to provide details and help you through the transition," according to a message distributed to residents. The buildings typically house more than 90 families. Some will be moved to permanent housing, others to another shelter. The message, which is apparently at least in part the work of the Department of Homeless Services, was provided to me by fax; thus the document reproduced below seems skewed. The shelter has not been sold, at least according to city property records for 603 Dean Street and the adjacent 768 Pacific Street, which are Block 1129, Lots 76 and 21, but they are subject to eminent domain. I don't know if any transaction is in process. 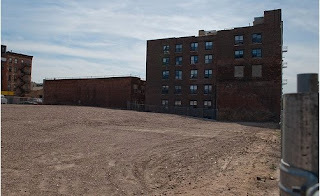 The block, at the southeastern section of the Atlantic Yards footprint between Dean and Pacific streets and Carlton and Vanderbilt avenues, is slated to become a massive interim surface parking lot, with 1044 spaces. Two fingers of the Prospect Heights Historic District bookend it. 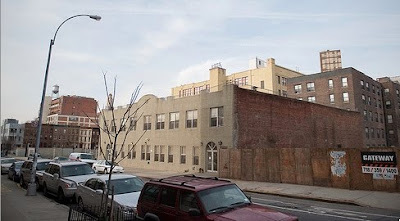 The Ward Bakery, site of the empty lot above, already has been demolished; in April 2007, when the bakery building's parapet fell, the residents of the shelter were temporarily evacuated. Another major building nearby, owned by eminent domain plaintiff Henry Weinstein, still stands. City Limits has reported extensively on the controversial firm connected to the shelter. In 2002, when the shelter was announced, residents were wary, as the Daily News reported, and some involved in that protest became activists fighting Atlantic Yards. That led to a debate about why those activists were then calling for shelter residents to be counted as potentially displaced from the AY footprint, as the Brooklyn Paper reported in February 2004. 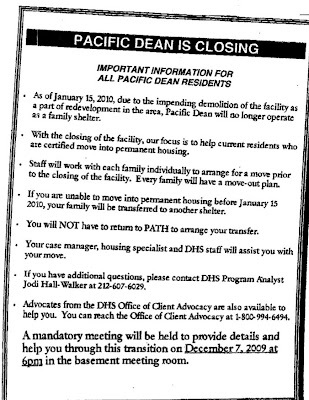 As of January 15, 2010, due to the impending demolition of the facility as a part of redevelopment in the area, Pacific Dean will no longer operate as a family shelter. With the closing of the facility, our focus is to help current residents who are certified to move into permanent housing. Staff will work with each family individually to arrange for a move prior to the closing of the facility. Every family will have a move-out plan. If you are unable to move into permanent housing before January 15, 2010, your family will be transferred to another shelter. You will NOT have to return to PATH to arrange your transfer. PATH is the Prevention Assistance and Temporary Housing Office in the Bronx.